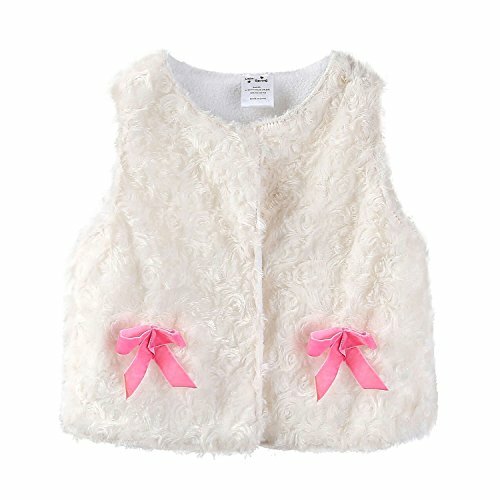 Very soft and light vest, warm and snug feel! 2-Layer, medium thickness, fabric made of coral velvet, inner made of polar fleece, it's great for baby in fall, spring or winter in the indoor. Snap closure to make sure the vest is put on and taken off easily. There is a bow in one of each side, you will get tons of compliments on it. It's still feeling great and no signs of wear and tear after washing numerous times. Easy Care, machine washable. Nice vest, we recommend. By the way, Manufacture Size Chart Is Attached Pictures Zone, It's A Helpful Sizing Assistant, we recommend you read it carefully before choose size, if you have no time, please note that our size for normal body shape only, if weight is more than/less than the normal body shape, please consider ordering one size larger/one size smaller. Thank you very much, have a nice shopping time.